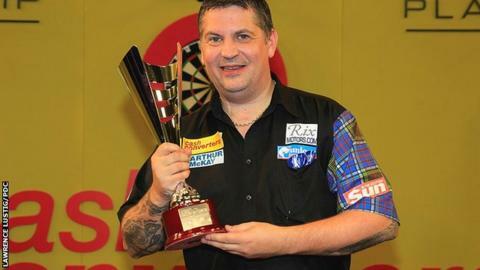 Scotland's Gary Anderson defeated Adrian Lewis 11-6 to win the Players Championship in Minehead. The 43-year-old, who is based in Somerset, claimed his first televised major since the 2011 Premier League. Stoke-on-Trent's Lewis, 29, levelled the final at 3-3 before Anderson took control with five straight legs. And, although former world champion Lewis fought back with three legs in succession, Anderson went clear again to secure the £65,000 first prize. Anderson, who beat Phil Taylor in the last eight, entered the event as the number one seed as a result of his performances on the Professional Darts Corporation Pro Tour during 2014. "I worked my heart out this year to get the number one seed and I've had probably the hardest draw that you could have had, so to win the tournament makes it very special," said Anderson, who has risen to fourth in the PDC Order of Merit. "I got off to a good start in the final too and it's great to walk away with the trophy." World number three Lewis, who won the UK Open at the same venue in March, added: "Gary finished number one in the rankings for this event and he deserved to win. "I dug in during the final but it just didn't happen for me and he punished me for it, and fair play to Gary because he took his chances well." The next major PDC event is the World Championship, which starts on 18 December, with Michael van Gerwen set to defend his title at the Alexandra Palace. The draw for the first round takes place on Tuesday.